The Senate’s fiscal troubles stand in contrast to the Assembly, where no layoffs are planned. Both houses sought to curtail spending during the recession. The Assembly’s budget changed at the same rate as the Senate in all but two years since 2007-08, records show. In those years, however, the Assembly took a smaller share of its allowable increase than the Senate did. On top of that, the Assembly transferred up to 15 percent of its budget to state programs that had been hit by cuts in recent years. In 2012-13, the one-time charitable transfers totaled $22 million, including $10 million to maintain child care slots, $2 million to the state arts council and other programs. That money, though, remains part of the Assembly’s own budget and could be redirected at any time. Debra Gravert, the Assembly’s chief administrative officer, said “smart management” of the Assembly’s budget prevented fiscal problems in the lower house. The Assembly should be fine even if the adjustment formula for the next fiscal year is comparable to the bare-bones 0.48 percent increase for the year ending June 30, she said. “We kind of thought ahead. We absorbed the cuts as best as we could,” Gravert said. While firings and personnel shuffles among legislative staff are common after elections and leadership changes, the November layoffs stood out for their scale. Senate officials at the time offered few specifics about the fiscal condition of the house. The cuts centered on a trio of Senate divisions: the Senate Office of Research, the unit that analyzes bills headed to the floor and a secretarial pool that provides temporary workers for member and committee offices. The layoffs take effect at the end of December, with those employees eligible for up to two months of severance pay depending on their years of Senate employment. Senate officials also are counting on attrition and a hoped-for budget increase of at least 3 percent in 2015-16 to close the shortfall. Senate employees will begin to contribute to their health care coverage, as well, to help cover health insurance costs that grew by more than $800,000 in 2014-15. The Senate Rules Committee also recently told Senate offices that any expenses need prior approval by the committee or will not be reimbursed. Senate spending on salaries and benefit costs increased by almost $4.4 million from July 2012 through June 2014, state budget records show. In addition, the Senate gave $1.5 million worth of merit raises of up to 5 percent during the 2011-12 fiscal year. Publicly available budget documents, meanwhile, gave no sign that anything was amiss with the Senate’s internal finances. After becoming Senate president pro tem in mid-October, Reeves said de León directed Danny Alvarez, a veteran budget aide, to review Senate finances to see if there was enough money to give employees a cost-of-living increase. Alvarez found that the Senate couldn’t even afford its existing payroll, Reeves said. There are notable differences in the budget of the Assembly and Senate, not the least of which is that the budget for the Assembly, which has 80 lawmakers, exceeds that of the Senate, with 40 members, by about $37 million. The Senate had about 990 employees as of January, according to payroll records. The Assembly had more than 1,200, its records show. While the Senate spends significantly more per member, the chamber serves the same number of constituents statewide as the Assembly. Senate employees on average have more experience in the chamber and are paid more. The average Senate salary last January was about $68,000, compared to $60,000 in the Assembly. As of January, the average Senate employee had worked there for almost eight years, according to Senate payroll records. In the Assembly, the average tenure was less than six years. In addition, the Senate and Assembly have different personnel systems. The Senate has more of a civil service structure, with different job classifications and slots for each office. In the Assembly, members receive a base amount of money to budget as they see fit. Both budgets, though, depend on calculations under the 1990 voter-approved initiative establishing legislative term limits. The measure linked Assembly and Senate budget growth to a constitutional formula called the state appropriations limit. The calculation, dating from 1979, reflects a previous year’s spending adjusted for changes in personal income, population and public school classroom attendance. Brad Williams, the former chief economist for the nonpartisan Legislative Analyst’s Office, said the appropriations limit can change significantly from year to year because of personal income fluctuations from the stock market and tax rules. For the year ending June 30, the budget growth limit came in at only 0.48 percent, about a twelfth of the previous year’s. The lower-than-expected number threw Senate finances out of whack and required immediate action, as opposed to a more gradual approach, Reeves said. 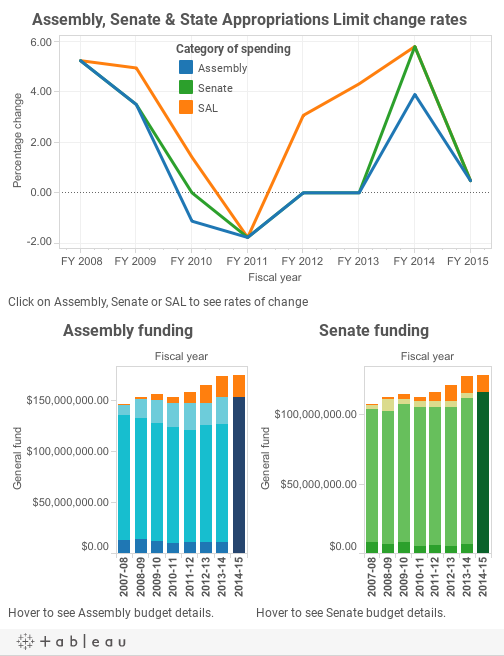 Percent changes in Assembly and Senate budgets and the state appropriations growth limit from 2007-08 through 2014-15. The Assembly took a smaller share of the allowable increase than the Senate did in two recent budget years.